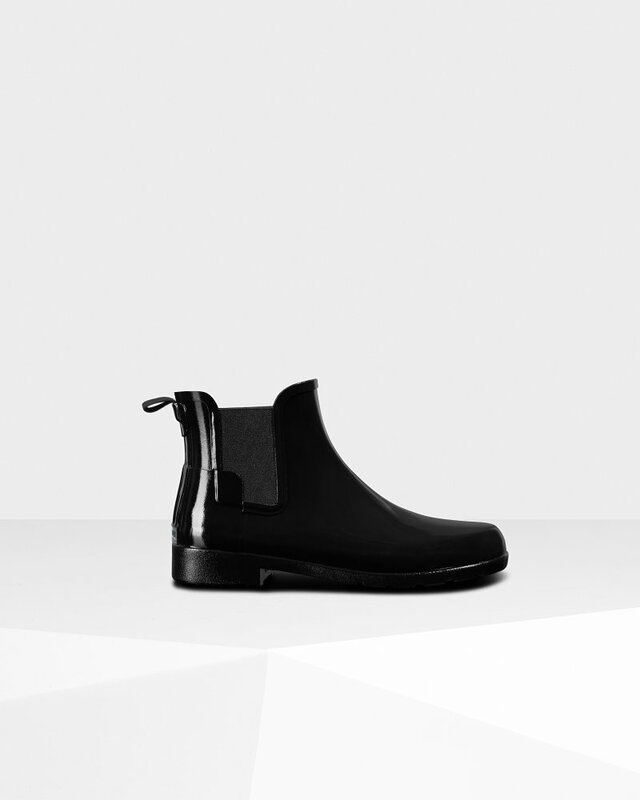 Women's Refined Gloss Slim Fit Chelsea Boot is rated 3.6 out of 5 by 11. Rated 2 out of 5 by Hailey from Love these boots but they have a short life span I love these boots so much! They’re so cute and comfortable and by far one of my favorite pairs of shoes. These are shoes I wear several times per week during the fall/winter/early spring. The only downfall is that after only a year and a half, they’ve cracked and split that’s 3/4 of an inch long. To me, it doesn’t seem like they’re worth the money you’re going to spend on them if they only last that long. Rated 1 out of 5 by Chrissy B from Rubber cracked I received these boots possibly a year and a half ago as a gift. The top of the boot ended up splitting open where the boot creases when you walk. After opening a case with Hunter they said because the boots were a gift and I didn’t have the receipt, there was nothing that could be done to help me, not even a discount could be given on a new pair. I think I was more let down by the poor customer service than the boots breaking to begin with. The boots were only worn in the rain not used for snow. As you can see in the picture the plastic all over the top of the boot was cracking. I am disappointed in the quality. Rated 4 out of 5 by ADuncan7 from Just like the picture! I love them, their super fun and comfortable. I’ll let you in a little secret, I wear them when they aren’t running!! Their so cute, I wear them all the time. So easy to keep clean too!! Rated 4 out of 5 by spitfire from So cute! I have been needing a new pair of rain boots for a while and figured I would invest in a nice pair. Enter: Hunter sale. I absolutely adore the color of these and the bootie style, they can be dressed up or down. My only issue with them is how narrow the ankle is, thicker socks don’t fit well inside the boot. I do realize they are slim fit, and this won’t stop me from wearing them. Rated 3 out of 5 by Susan from Great looking but does run narrow Love the look and color of the Chelsea boot but it does run narrow. Pay particular attention to "slim fit" in the name. Rated 5 out of 5 by becca9 from Not great for high arched feet I've had the original fit boots and they sometimes bothered my feet, these ones fit differently than the original fit. If you have a high arch, I would go with the original fit because these are slimmer. That being said, I absolutely love these boots!